What Happens to A Cat's Drive After Spay-Neutering? Are Cats Still Sexually Active After Spay-Neutering? Not usually, although cats who were sexually mature at the time of spay or neuter may still have some of those "desires to mate." The desires may be there whether or not those cats have previously mated. In fact, depending on his age at the time of neutering, he may retain those mating urges, for some time after the "snip snip." In fact, the timing of that castration surgery is an important factor in his sexual urges after neutering. 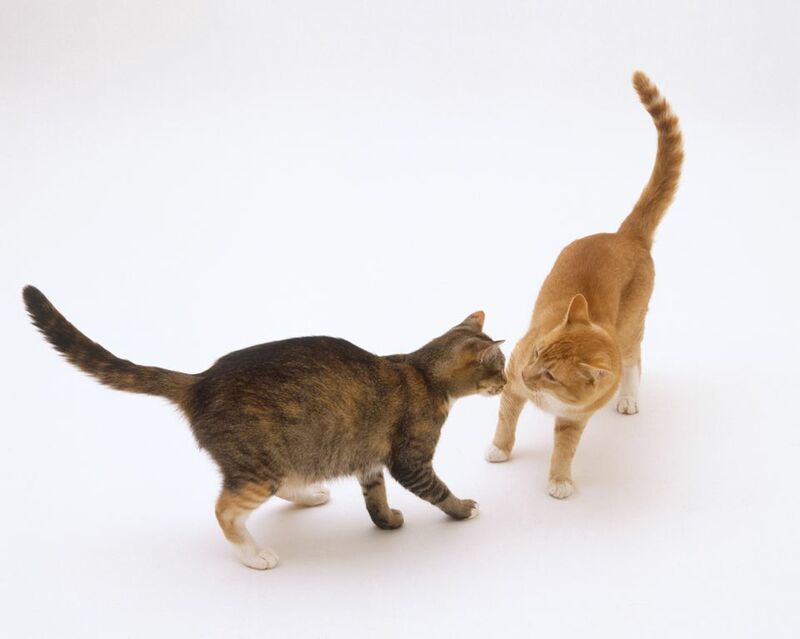 It is not at all unusual to see neutered cats attempting to "hump" other cats, either male or female. Actually, this behavior may not be sexually related at all but may be simply a matter of assuming seniority, if not pride status. This is more likely to happen with male cats who have been neutered well after developing their gonads. As a matter of fact, breeders have taken advantage of this phenomenon by sometimes using what they call "Teaser Toms" with their queens in oestrus (heat cycles), when they don't want them to bear another litter at that time, to prevent certain adverse uterine conditions that sometimes arise under those conditions. The dilemma is that the hormones breeders use to control estrus in their breeding queens can cause pyometra (potentially fatal) if overused. On the other hand, allowing a breeding female to go into estrus over and over again, can be equally problematical, possibly resulting in polycystic ovaries, which could require spaying. Some breeders can prevent their queens from going into "call" (estrus) with acupressure. Others prefer to use Teaser Toms. A "calling queen" leaves little to the imagination. She acts like a feline hussy, rubbing her body against any surface that provides friction. It's no wonder that every whole male in the area is drawn to her presence, if at all possible. The last thing a reputable breeder wants is for her prize queen to become impregnated by some disreputable (and untitled) street Romeo. Enter the Teaser Toms. Teaser Toms are sterile males in good health, which are used to "service" a calling queen. According to Gitalaya's Cattery article, Teasers may have been rescued from an SPCA group, adopted as a kitten from a moggie litter. Since they are used as "stud substitutes," they should have a gentle disposition, stamina, and be in peak physical condition. Though he is sterile, a teaser tom may have the same living arrangements as a top stud, including q quality diet and routine veterinary care. Cats are not the only animal where "teaser toms" are used. A study was made of "the effect of sterile service on estrus duration, fertility, and prolificacy in artificially inseminated dairy goats during breeding season". The result of the study was the conclusion that sterile service (teaser bucks) "reduces the duration of estrus and increases fertility in artificially inseminated dairy goats." Teaser Toms are whole male cats that have been rendered sterile by a vasectomy. Since procreation is not intended, but instead, the "sexual satisfaction" of the queen, any almost any whole adult male cat may be used as a Teaser Tom, as long as he meets certain criteria. Previously sexually active males, such as retired studs, may be enlisted as Teaser Toms, as well as non-pedigreed males. You might say that a teaser tom is "Just a Feline Gigilo."